In a previous blog post, we talked about where to start a literature review. 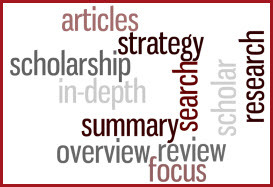 Review articles are good places to get a basic understanding about a topic or subject area. It is helpful to make the distinction between review articles and research articles. When scholars and researchers release their work to the public, they usually publish them as research articles in a scholarly journal such as Political Science Quarterly or American Anthropologist. Research articles generally contain a summary or abstract, a description of the research or discovery, the significance of the results, and conclusions. They are the best way to access the most recent scholarship on a topic. However, they are NOT good places to find basic summaries or general introductions to a topic. For this purpose, review articles can be better. For instance, the first article below is a typical research article from an academic journal that offers a detailed examination of the current relationship between domestic terrorism and political party system in India. The second article, a typical review article, provides a lengthy and comprehensive introduction of the current research on terrorism causes and counter-terrorism strategies at a macro-level. (1) Piazza, James A. “Terrorism and Party Systems in the States of India.” Security Studies 19, no. 1 (Jan, 2010): 99-123. (2) LaFree, Gary and Gary Ackerman. “The Empirical Study of Terrorism: Social and Legal Research.” Annual Review of Law and Social Science 5, (2009): 347-374. Of course, research articles are essential after you’ve gotten a basic understanding of your topic and are ready to forge ahead. But, remember that review articles can be a helpful stepping stone along the scholarly path! Where to start a literature review? More than Half a Million Free Articles in arXiv!